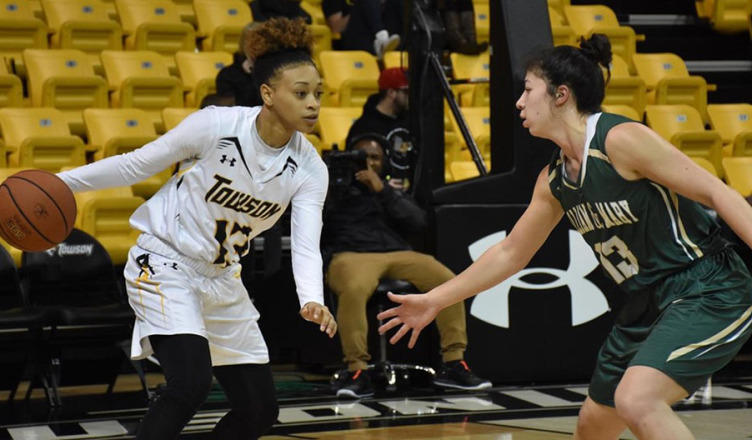 Despite having three scorers in double-figures, Towson dropped its fifth straight game Sunday at the hands of Colonial Athletic Association rival William & Mary, 68-55. After trailing early, Towson scored 10 of the last 15 points in the first to pull to within one point heading into the second quarter. The two teams then traded buckets in an even second quarter until junior guard Latrice Hunter hit a clutch three to give the Tribe a 29-23 lead. However, junior forward Mary Cuevas capped a 7-2 run for Towson with a putback with one second left in the half to give the team a 1-point lead. Both teams came out firing in the second half and the Tigers stayed even with the Tribe. However, the Tribe took a 47-44 lead going into the final quarter. William & Mary used a 12-5 run early in the fourth to jump out to a 10-point lead that Towson could not overcome. The Tigers never mounted a serious comeback in the fourth quarter, and the Tribe secured the victory. Cuevas, senior guard Raven Bankston and sophomore guard Sianni Martin all dropped double-figures for Towson. Towson will look to snap its five-game losing streak Friday when the team hosts rival Drexel at SECU Arena. Tipoff is scheduled for 7 p.m.